Young Georgia lived on her family farm in Minnesota. She wasn't a huge fan of school, having determined in childhood that she would be an artist, but she also didn't want the life of a housewife. In the early 1900s, there were few choices for women, but luckily Georgia's family sacrificed to send her to schools where she was able to get some art instruction. She had enough talent and vision that her instructors thought she could be an instructor herself, leading to a variety of jobs in places across the US. Her family has relocated to Williamsburg, Virginia, but her father is struggling to keep everything afloat. Georgia continues to paint, explore what art means to her, come in contact with influential artists of the early twentieth century, and eventually establish her long and successful career. Strengths: The brilliant part of Meyer's historical works is that she pays SUCH attention to details of every day life. This has always been why I adore historical fiction. What did people wear? How were women treated? What was it like teaching in a small town in the 1920s. Meyer puts in lots of these details, along with discussions of the larger issues in O'Keeffe's life. Like Girl with a Camera, this is an excellent portrait of a groundbreaking woman who did not let social mores of her time define her, so is timely motivation for young readers of today. Weaknesses: Not a weakness of the writing, but O'Keeffe moved back and forth across the country so much that I was a little confused. Of course, it's also one more reason why her life was much more exciting than mine! What I really think: Historical fiction always takes a little bit of hand selling, but I am definitely purchasing this one, and handing the ARC to one of my 8th graders today! Ms. Homayoonfar was born in the early 70s to a French mother and Iranian father. She spent her formative early years in Pittsburgh, so moving to Iran was a bit of a culture shock. Still, Tehran at the time was a vibrant city, her family were very accepting, and she managed to acclimate herself to her school and friends. When the cultural revolution comes shortly after the family settles in, life changes dramatically. Music and western culture is frowned upon, school starts to require Muslim religion classes, and even young girls are required to cover their heads out in public. Even private behavior is monitored. It is a difficult time for the whole society, but the differences between her former life in the US and her new existence made this especially hard for a tween girl. Eventually, the family decided to leave the country, but even that was difficult. 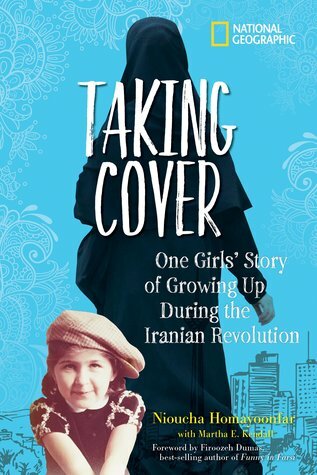 Firoozeh Dumas, author of It Ain't So Awful, Falafel, has written the forward, and Taking Cover is an excellent nonfiction accompaniment for that book. Strengths: There need to be so many more books about the daily life of average kids from around the world and through periods of history! Middle school students have such a hard time even grasping a world without cell phones, that I love to give them books that describe the ways that other people live. Interactions with family, fitting into a new culture, and details about life in 1979 all make this a tremendously fascinating read. Weaknesses: While the details of Homayoonfar's life are fantastic, I could have used a little more historical background for the sociopolitical circumstances at the time. Also, the print was a bit on the small side; it shouldn't make a difference, but it does! This book is fairly short, and increasing the font size would have made this more appealing to tweens. What I really think: This will circulate heavily when memoirs are assigned. I have had a few students from Iran, and they might find this history of their family's country interesting. I just appreciated knowing more about what was going on in the world when I was in middle school! I remember doing a report on Georgia O'Keefe about the time I was in 9th grade. I pulled all the info out of a Encyclopedia Britannica article. This sounds much more inviting. Thanks for sharing. Girl with Brush sounds amazing! I'll have to look for it. I know I've got a copy of "Taking Cover" in my To Be Reviewed basked... waiting for me to crack the cover. Anything about Georgia O'Keefe is interesting to me. I've been hearing about Taking Cover and will try to get to it soon. Thanks for the post. This is my first introduction to Girl with Brush and Canvas. But I love what you shared about the author paying attention to the small (but important) details of life. That is so very important and can really bring the person to life. Thanks for sharing these new titles! 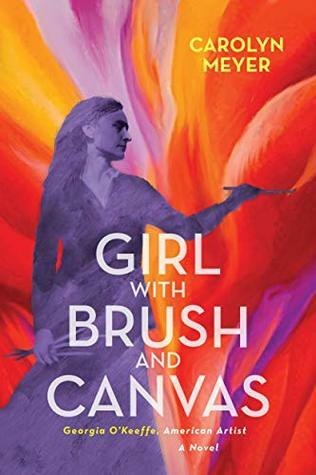 Girl with Brush and Canvas sounds exactly like my kind of read - thanks so much for sharing - I immediately put it in my Goodreads To-Find list. :) Have a great reading week ahead of you!